Have you ever thought about only hunting private property but do not have the time to locate, scout, set stand sites, plant food plots, and manage the wildlife on the properties? 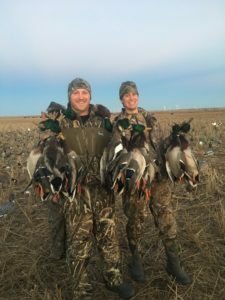 The Oklahoma Hunt Club provides these services to our members for an annual membership fee. Members will never have to worry about a place to go hunting even if its a last minute hunt. For less than the cost of a week long guide trip to a lodge our members receive Unlimited Year Round Hunting to multiple managed properties. Members will just go to the website and reserve which property is available to hunt for the species they intend to pursue. Having thousands of acres of private property scattered across Oklahoma allows for a wide variety of hunting opportunities. The properties are all managed annually for wildlife. The club provides all blinds so members do not have to worry about hanging tree stands and building duck blinds. Members just show up and go hunting. The club employees do all the management on the properties, including seasonal food plots, planting Millet on waterfowl properties, and maintaining feeders to keep the game on the properties. The properties will have trail cameras to help manage the deer populations and to allow immature bucks to grow to their maximum potential. Ground blinds and tree stands will be in place, blinds will be constructed, and scouting reports will be available throughout the season on the website. While many members ask about public land and several other hunting clubs utilize public properties our club is different. Public land in Oklahoma is far over hunted and under patrolled. Our number one concern and priority for our members and their families is always SAFETY. Although public land is free it ultimately comes at the costs of accidents, stolen property and disappointment. We do not only enjoy serving your needs but the needs of your friends and family. We offer a Referral Incentive of $750 for each SIGNED member you refer. You can use the incentive toward Guest Fees or Annual Dues the following season. All Referral Incentives must be used within ONE (1) year. If you have questions about the properties, hunting information, Referral Incentives, or anything else covered in this guide, please contact Tyler Gottula at 918.633.4589, Bryce Gottula at 918.520.2994 or Mark Gottula at 918.232.1974 or contact us online. We will always be available to assist members with any of their questions or problems.